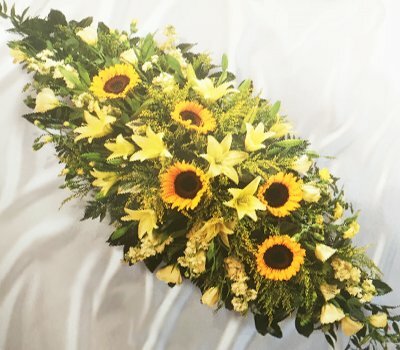 A selection of bright sunflowers are arranged with stunning cream lilies, cream lisianthus and cream larkspur surrounded with a selection of green foliage to create this beautiful casket spray. Featuring: Cream LA lilies, sunflowers, cream lisianthus, cream spray carnations, cream larkspur, yellow solidago, surrounded by mixed of fresh greenerys, finished with a funeral card with your personal message in. Please allow 4 days notice before ordering funeral for this spray.